The FAA has just granted us clearance to 25,000′ MSL for Saturday July 29 and Sunday July 30! Discussions are still going on as to specifics, but it looks like we’ll have 2 windows each day, probably 10 AM to noon, and 3 to 5 PM, when we can exceed our standing 16 K MSL waiver, and fly up to 25 K.
While I appreciate this isn’t much notice, the fact that we got it at all is a great sign for future launches, and will pave the way to the possibility of even higher wiavers in the future (our field can support flight operations of up to 32,000, but we’ve never been able to exceed 16 K before now). Given that this is the same weekend as the OshKosh fly-in, Chicago air control was NOT easy to convince! If you have something big you feel like flying at NARAM, bring it on out! Registration is open online through Tuesday (www.naram.org), and you can also just pay cash at the field if that’s your preference. If you do want to put something up over 16K, please call Rob Dickinson (616) 350-2010 so you can be kept in the loop as details get finalized. We are pleased to announce that NARAM 59 will include the Fly-It/Take-It program, once again sponsored by the Ha family. This is an excellent opportunity for the NAR community to “pay it forward” and introduce the joy of model rocketry to the next generation of rocket fliers. We’ve all seen, and many of us have participated in Make-it/Take-it events in the past. Participants go to an event, build a simple rocket kit, then go home. Maybe the rocket flies at a future launch; maybe it gets put on a shelf, maybe it even gets tossed out. We want to provide an event that will at least get people flying model rockets, and hopefully, keep them flying! 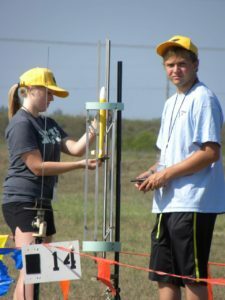 The Fly-It/Take-it event is an activity that involves young people and first-time flyers of all ages, by giving them a chance to fly a rocket for free, and then to keep the rocket. 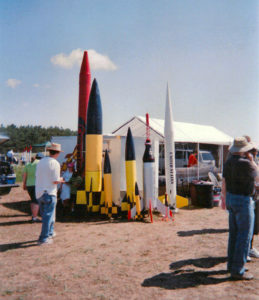 Anybody that has never flown a model rocket before or any youth under 13 years old (12 or less at the time of the event) will be able to come to the main tent at the NARAM 59 sport range. A selection of model rockets will be displayed there and the participant will be able to choose one that appeals to them. They will be provided with a rocket motor, chute wadding and assistance in prepping the rocket. They will then be able to go to the sport range and fly their rocket. The rocket is then their’s to keep. Additional flights can be made on their own if they wish. The Fly-It/Take-It table will be for sure open during the Sat/Sun sport launch days as well as throughout the rest of NARAM as long as supplies last. NAR members and sections are asked to help provide rockets for the Fly-It/Take-It program. Sections are encouraged to personalize or customize the rockets that they build. Patriotic themes, or section-specific markings are encouraged. Sections may want to ask local hobby shops or vendors that attend NARAM for donations of kits or parts for this event. Donated rockets can be any kit or scratch-built or ready-to-fly rocket. We only ask that they must fly on a single 18mm black powder rocket motor. A recovery device must be included (as needed) and can be any method, but complex designs (such as competition helicopters) are not recommended. We do ask for only new rockets. How do you donate rockets? You can bring rockets with you to NARAM and deliver them personally. You can simply bring them to the Fly-It/Take-It table at the sport range. Tom wants to thank the following for helping to make Fly-It Take-It a reality. The NAR will host a Sport Launch area for all non-NARAM 59 flights. The pads will be set up to the west of the Contest Range. An FAA Waiver will be in place to fly up to 15,000 feet AGL. The Sport Range will be managed by MMAR, the site host club. They will support a number of high powers pads. Pads will be available with all standard rod and rail sizes up to 1.5″ rail. A 17 foot launch tower will be available at the 1,000 foot cell for larger launches. If you need non-standard launch equipment for your project. please contact the Sport range Manager, Rob Dickinson, at 616 350-2010, or rdickinson@email.com. We will do all we can to make sure you can launch your project! If questioned, fliers must provide evidence that any high-powered rocket that they present for flight will not exceed the 15,000-foot waiver ceiling limit in effect. No one under-age or not certified for the applicable motor impulse will be allowed past the safety check with a rocket co ntaining a high power motor unless accompanied by an appropriately certified sponsor. All igniters for high power rockets will be installed only at the pad before the flight, They must be brought to the safety check in desk separately from, but along with the rocket. Altimeters with ejection charges are no to be powered up until the rocket is at the pad and raised for flight . We use FRS radios to announce our events, so bring your radios, and listen along!